I'm in the middle of doing what millions of us do each year (or every couple of years). 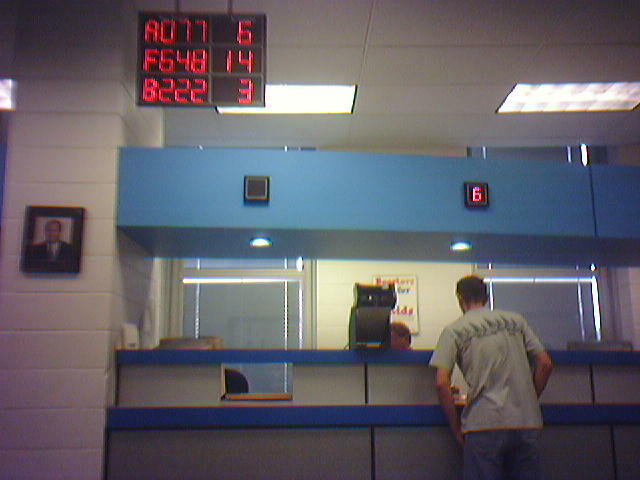 Enduring a visit to the local Department of Motor Vehicles (or DMV). But I've been noticing something different about it each time I come. Mainly, that it keeps getting easier. I know. Hard to believe. But the branch that I go to in Chicago must have had an experience design professional consult with them or something. While sitting waiting for your number, you also get clear audio cues when called. Plus, once your number is called--it stays up on the display for a bit so if you didn't hear it beaing called you still have a chance. All of the signs were clearly displayed and provided visual cues so you knew where to go next. The flow was intuitive and natural. Each time I completed a step, I had to move to the next station located over to the right. The lighting was appropriate and the employees were relatively friendly (yes. I actually wrote that). What's happening here? Though it's a smart move, the city of Chicago really doesn't have a ton of incentive to improve the DMV experience right? I mean, people still HAVE to go to the DMV. It's not like we have a choice. And think about the crappy experiences we all have at the DMV. I mean, it's like we expect it to be bad. The reason why I think it's smart to have a good DMV experience is because the city of Chicago realizes that people associate interactions like this with the city itself. Chicago is one of the hardest working towns around because it feels like it has to compete with the coasts. Mayor Daley is constantly pumping money into the lakefront, park programs, airports and other areas that people have "first contact" experiences when visiting. Think about it. One of the first places you need to go when you move into a town is the DMV. You'll eventually need to update license, registration ect. So a good experience here says a little something about the town you chose to move to. So if this DMV can get it right, how much more are we tasked to? Are your Websites usable? Do your marketing strategies make people feel good about the time they chose to spend with you? Do your brand initiatives make people say "this is why I stay with this brand. They get it right". So are you providing great experiences that put other brands to shame? I don't live in Chicago because they have an effective DMV. But I do live here because the city offers culture, business, a stellar waterfront, and my family enjoys good schools and neighborhoods. Think of these as "touch points". Each touch point matters. Each experience influences my decision to stay or move. Brands, agencies, businesses and everyone else. Make sure you take care of even your smallest touchpoints. They matter. And we remember them. Each and every one.